The base module, with more functions than the step-in products Topocad Reader/+ and Topocad engineer, is a complete CAD package made for surveying, mapping and design. Functions that bring your field data to a map or drawing for publishing. 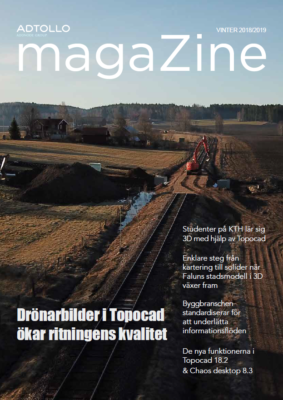 Topocad communicates to field computers, field format files wheter it is serial communication, by PC card or using the implemented applications from the total station/GPS vendors. We communicate with Trimble, Leica, Topcon and Sokkia instruments and with all kinds of file formats. Topocad handles data from and to total stations (survey raw data or local coordinates), levellers and GPS instruments, both GPS vectors and lat/long data. Data is calculated, processed and/or transformed to the drawing, point codes and geometry is taken care of and you will get a result in your drawing or map better than you imagined. Topocad handles a lot of different methods for lining, radius, splines, closed and filled surfaces etc. The CAD is our own engine, with our full management and made for surveying and mapping all functions are made for your work. The CAD platform is very well developed and has numerous of functions for creation and modification of objects, whether there are points, lines, surfaces, polygons, symbols, texts, raster files, etc. In the base module we have implemented transformation of vectors and raster files. There are also a very strong output function for creation of your drawings and maps, with functions for legends, insertion of several views, coordinate grid and adjustment of the drawing view. The CAD format TOP is a hybrid between the surveyors coordinate files, the drawing formats like DWG, DGN and geographic information systems file formats with their typical attribute data. This means that you will not loose any data going to Topocad’s TOP file. We import and export many different file formats as co-ordinate files, drawing files and GIS files. The base module includes the DTM creation and modification and together with this contouring. The base module also includes road line file format, road line editing and calculation and many commands to compare points against a road line.